It is with deep sadness that BlogtorWho reports the death of Doctor Who director Paddy Russell. 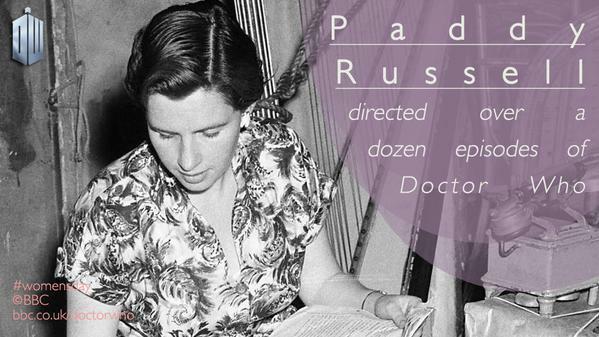 Paddy Russell was one of the first female Directors at the BBC and an example of someone who progressed through the ranks. Beginning as a Production Assistant during the 1950’s, progressing to a Floor Manager, Russell became a well-respected television Director and then Producer. She directed classic shows including ‘Compact’ and ‘Z Cars’. Her early career also included work on the three Quatermass serials. It would however be another science-fiction show which Russell will perhaps best be remembered for. Paddy Russell became the first female Director of Doctor Who when she helmed ‘The Massacre of St Bartholomew’s Eve’ broadcast in 1966. Sadly the four-part story is no longer in the archives for us to enjoy and reflect upon. There are also no clips or telesnaps so there is no visual record of Paddy Russell’s directorial debut in Doctor Who. Fortunately, she would later return to Doctor Who in Jon Pertwee’s final season to direct ‘Invasion of the Dinosaurs’. Russell recalled the story for the DVD range, featuring in the DVD commentary and ‘Making Of’ documentary, a clip of which can be found below. She returned to Doctor Who, working with the Fourth Doctor Tom Baker, who spoke particularly highly of her. Perhaps Russell’s most heralded story is ‘Pyramids of Mars’. A classic story featuring Egyptology in a suitably Gothic setting, it often ranks in the lists of fan favourites. Her final directing work on Doctor Who proved to be ‘Horror of Fang Rock’, again starring Tom Baker, in 1977. This story of course introduced the scourge of the Sontarans; the Rutans. After Doctor Who, Paddy Russell would also direct episodes of ‘Emmerdale’ before enjoying her retirement after a career spanning four decades. BlogtorWho extends our thoughts to Paddy Russell’s family and friends at this difficult time.